If you could change one thing in your life to ease your pain, what would it be? Diet? Exercise? A new doctor or the latest medication, perhaps? I believe the single biggest factor in helping ourselves is our attitude. Diet, exercise, and life style choices are great too, but you have to have the proper mindset for those things to work. Mindset is all about our way of thinking, attitude, and disposition. So if you are confronted with a challenge, like living with a chronic condition, how are you going to respond? After several years of doctors and medications, and doing what I thought I was supposed to do, I knew I needed a change. I wanted to be in control of my situation – I knew I could contribute to changing my outcome or I could continue as I was and just keep taking the pills the doctors prescribed me, spend days in bed exhausted and in pain, have the side effects, and miss out on life. Change. It’s a scary thing sometimes. I made a conscious choice not to be a victim and to deal with this syndrome with positive attitude and healthy habits. But to be perfectly honest, some days it is tough to maintain the positivism when you absolutely feel like you have been hit by a mack truck. I am not going to lie and say I don’t have bouts of crying and “why me?” moments, but they are fewer and far between since my shift in attitude. So how do you cultivate a positive mindset when you are dealing with the chronic fatigue and pain from fibromyalgia syndrome, or other similar conditions? It’s important to listen to your body and what it’s trying to tell you. Some days you just can’t do it all, or even much at all, so give yourself permission to slow down and take a break. Try to get some extra sleep. Try massage therapy, which can help retrain your muscles to maintain a more relaxed state and reduce some of the pain. Visualization exercises – A friend of mine told me she does this in the shower each day: Imagine all of the stress, problems, pain, and negativity to flowing out of your body, out through your fingertips, and down the drain with the running water. Brain dump exercises – Another technique for those sleepless nights is to write everything down to clear the chaos and clutter from your head. This helps you clear your mind and sleep. I picked this strategy up, after working a tornado response for several weeks, and have used it several times since. Sometimes it is hard to find things to be thankful for when you are dealing with pain and limitations in your life. But the sheer act of writing down those thoughts and committing them to paper helps to reinforce a positive attitude. I try to start each day with an attitude of gratitude, by writing down three things for which I am grateful. And some days I play catch up for a couple of days. But that’s OK too, because I have given myself permission to not be perfect! You have the power to decide whether to let the pain control you, or you control the pain and its effect on you. Concentrating on the pain just allows it to grow and take over all aspects of your life. Developing a positive outlook and response to your pain, can help you change some of the negative effects of pain in your life. I am not saying that shifting your mindset will alleviate all pain in your body. I am saying that changing your outlook on life and learning better coping mechanisms can improve your response to the pain and lessen the effects. It will help you be open to other positive changes like diet, exercise, and other more natural healing. A positive mindset is just one of the tools in my arsenal that allow me to deal with fibromyalgia and chronic pain in a healthy and holistic way. I choose to use diet, exercise, and mindset to cope with my fibromyalgia, but I do seek out medical help when I think that it’s something more or the pain becomes acute enough that these strategies just aren’t working. 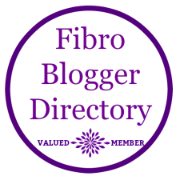 I have fibromyalgia, but it does not and will not have me. Do you have other strategies you use for maintaining a positive outlook in the face of chronic pain? What do you feel like is the biggest change you have made to make a difference in your battles with pain or fatigue? This was updated from a post on April 29, 2017, entitled Mindset and Fibromyalgia.